When you buy carpets, you have to keep in mind that your pets and kids are going to be in contact with it. Your kids are going to play, spill food, or your pets may even leave urine on them. And that is why you should always buy carpets that can be cleaned. There is no dearth of washable carpets, which you can clean yourself. But if your carpet is the difficult kind then hiring residential carpet cleaners Irvine would be your best You can hire commercial carpet cleaners Irvine easily. The second important aspect to consider is the price. If you have a budget, then choose your carpet as per it. If, however, the price is not something you worry about, then the sky’s the limit for you when it comes to choices and varieties. There are certain carpets that shed threads and fibers. They can cause a lot of dirt in your home. If you are a clean freak like me, then it would be wise of you not to choose something that adds to your daily chores. Your house’s carpets are as important as any other item in the house. Hence, it can build or ruin the overall look of the interior space. However, if you follow these tips on how to choose the right carpet, your house will look great and will always be a subject of envy for your guests. Wondering How to Choose the Best Air Duct & Dryer Vent Cleaning Service? Here Are the Tips! The first and most important thing to consider while hiring such a service provider is their reputation. Yes, reputation is something you shouldn’t ignore under any circumstances. Choosing a service provider with a great reputation means they are going to handle your project well. This comes as a relief when you don’t know much about the service provider, personally. The second thing to consider is the fee they charge. Is it too high? Is it not proportional to the quality of service they provide? If you feel for even once that you are being taken advantage of, you should reconsider your decision of hiring a particular service provider. Neither too high nor too low is a price good. You should go for a service provider that offers great services at reasonable prices. The third aspect to consider is the tools they are going to use. Ask them what kind of technology they are going to employ. Do some research on your part, and find out which technologies or tools or cleaning agents are the best for this kind of cleaning, and then talk to your service provider about their preferences. If you feel they are too outmoded to be hired, you can look for some other cleaning company. Also, don’t forget to find out if the concerned service provider is certified to handle the job they do. Aren’t these some really great tips on how to choose the best cleaning service for your air ducts and dryer vents? Well, why not! So, if they are dirty, you already know what your next step should be. Yes, call a cleaning service right away! For reliable cleaning services, you can visit at- https://goo.gl/MWfbpo. https://www.echocarpet.com/wp-content/uploads/2017/11/Untitled-design-3.png 800 1024 Amir https://echocarpet.com/wp-content/uploads/2017/03/Echo-Carpet-Services-LOGO-1-300x118.png Amir2017-11-28 01:41:312017-12-11 00:59:51Wondering How to Choose the Best Air Duct & Dryer Vent Cleaning Service? Here Are the Tips! Carpet cleaning in Irvine is amongst the jobs that just can’t be ignored from your file of irregular but significant tasks. Dirty carpets can become a thing tainting your clean indoor air, and can also lead to the growth of microscopic insects that can be hazardous for your health. There are already many people who are aware of how frequently a carpet needs cleaning. It is not something that needs to be cleaned daily because these don’t get soiled easily. You just need to ensure that you get it done around 3-4 times a year. However, this occurrence should be more if you have pets and kids around. The best way to save you the stress is to hire carpet cleaners in Irvine. There are many companies offering carpet cleaning in Irvine ca but it is always sensible to evaluate carefully before hiring just anyone. Are you looking just to remove the stains from your carpet? Do you feel vacuuming your carpet would have the desired result or does it need thorough washing and disinfection? We at Echo Carpet Cleaning Man help make these things clear before you make a final decision. 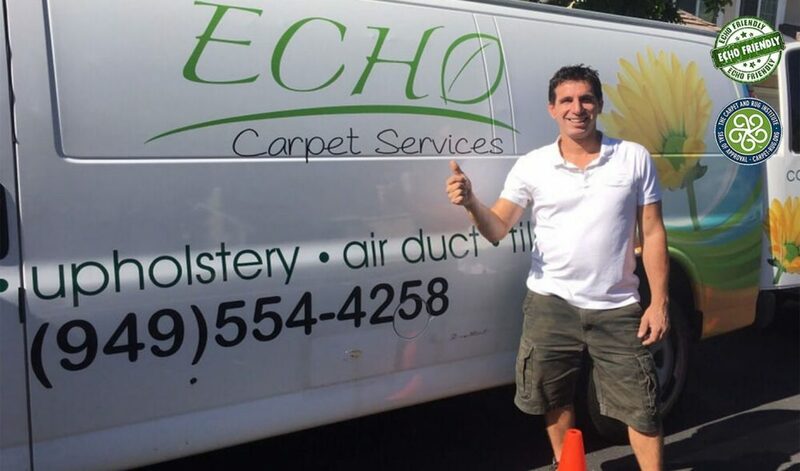 Echo Carpet Cleaning is the perfect company that aims to offer first class carpet cleaning in Irvine. You would not only end up saving your hard earned money, but will also be guaranteed that the carpets are cleaned with the use of eco-friendly and non hazardous chemicals. A professional carpet cleaning service in Irvine CA would definitely be aware of the ruthless detergents that damage the color as well as the vigor of the material. With skilled cleaning of your carpets, you can rest assured that Echo Carpet Services chooses the correct cleaning method depending on the fabric of the carpet and the amount of soil and dust stuck in the carpet. So, what are you waiting for? Hurry! Call us at 949-554-4258 to book our carpet cleaning service or drop us an email at info@echocarpet.com. We bet you will love our service. Cleaning up a carpet could be one of those long standing pending things around the house, that you intend to do but do not actually get it done. The thought of all the effort which is involved with cleaning the carpet can be quite discouraging. Even if you finally make up your mind to clean the carpet, you might end up not having the right tools nor know the right techniques to get the job done. Cleaning a carpet requires a lot of effort and expertise which can be better handled by professionals. We believe at Echo Carpet Services we are the best professional carpet cleaning service in your own town of Irvine, Ca. Being professional carpet cleaners in Irvine, we provide a whole range of carpet cleaning services with a personal touch. We offer all the advantages of being a local family run business by applying care and importance to your home as we would have treated our own. We at Echo Carpet firmly believe in customer retention and over the years we were able to build a loyal customer base through our top class service. Carpets, over a period of time accumulate lot of dust which not only cause damage to the carpet but also might result in health issues. We use the best techniques and equipment that effectively clean and sanitize your carpets. Our methods of cleaning are safe and non toxic, which does not cause any health related challenges to your family. We have been consistently ranked as the top services for carpet cleaning in Irvine, Ca. Our continuous drive has been to keep improving on our professional services to ensure that we provide the best carpet cleaning services across Orange County. Not only carpet cleaning, we are one of the sought upholstery cleaners in Irvine. Our other services include cleaning rugs, air duct cleaning, tiles cleaning etc. Our services can be easily availed by calling us on our number. As part of improving our services to the customers, we have a free online estimate option wherein you provide us details online of the cleaning to be done and we would provide the estimate of the total charges. This will help you to plan accordingly. Keep your carpet cleaning woes aside to spend your time and effort more effectively by allowing us to take care of what we do best i.e. cleaning the carpets. Cleaning the carpet at home can be a tough job. All the dust, germs and other minute particles which carpets accumulate over a period of time requires more than a regular cleaning. Professional cleaning will help to reach all the layers of the carpet and rid it off all the accumulated dust and debris which is not possible through conventional home cleaning techniques. Higher range of professional cleaning equipment is required to be able to effectively clean the carpets. A residential carpet cleaning service is the best solution to ensure that your carpets look clean as well as keep the environment within your house healthy. Hiring professional carpet cleaners for residential purpose has benefits. Carpets are cleaned in real sense i.e. not only the carpets appear cleaner outwards, but any dust, bacteria or other germs across the layers are cleaned. Professional cleaning methods like hot water treatment would help to kill nay bacteria or germs within the layers of carpet. Best techniques to clean carpets of various materials can be determined by the professionals. The right machinery and means are employed to treat each material differently for effective cleaning. All the efforts involved in moving around the furniture and physical effort of cleaning can be saved as we at Echo Carpet Services handle all these activities, so that you can leave the cleaning to us and you can focus on other things. The cost of equipment involved in cleaning carpets is on the higher end. By hiring professional carpet cleaners, you can save on the costs of purchase and maintenance of the equipment. The costs that you incur in hiring a professional carpet cleaner are much less than the cost of buying the equipment. 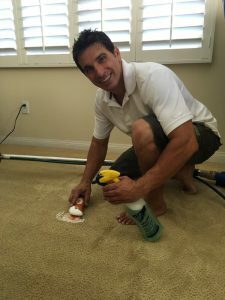 Echo Carpet Cleaners is one of the best residential carpet cleaners in Irvine, and you can reach out to us through a phone call. We will provide you an end-end solution with top quality service for all your carpet cleaning needs wether at home or office. Cleaning of a commercial space requires a specific skill set and coordination of different aspects. 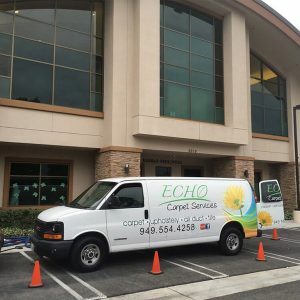 Echo Carpet Services provides you best service for commercial carpet cleaning in Irvine. Carpet at commercial space endures a lot more than a carpet at home, with more people walking over it and all the elements that it is exposed to. The area of the carpet to be cleaned would also be much more in comparison to the one at home. Hence it requires specific equipment which can handle such large spaces as well as understanding of the different type of cleaning that is required to get rid of the dirt and germs due to the heavy usage. The products that are used to clean by Echo Carpet Services are eco friendly and non hazardous. Wether the requirement is to clean the carpet at your home or at the commercial place, Echo Carpet Services has the right tools and expertise to handle these various needs. When you’re trying to balance work and family life, it’s easy to let the state of your home slip through the cracks. While we all want to have a beautifully clean home, worthy of an interior design magazine, cleaning our houses can oftentimes take a backseat to our other obligations.